TCU in South Africa is the newest and most cost-effective program offered by the Center for International Studies. However, the low-cost alternative isn’t the only intriguing thing about this program. Richard Puett, an environmental science major and program applicant, said the main reason he applied was the opportunity — the low program fee was just a bonus. “We chose South Africa because it will allow our students to engage critical global issues like sustainability, democratization, social inequalities and public health from a completely different cultural perspective,” said Program Coordinator, Jesica Severson. This program, located in Stellenbosch, which is near Cape Town, is cheaper than the other six study abroad flagship programs TCU offers during the spring semester. In total, it will cost the student $3,500 in comparison to TCU’s most expensive program, London Westminster, that costs $10,000. “We are committed to ensuring that any student who wants to study abroad is able to do so, regardless of financial circumstances,” Severson said. Students with financial aid can also apply it to the program, making studying abroad more obtainable for students. While in Stellenbosch, students will get to visit the Amakhala Game Reserve, a Big 5 wildlife conservancy, to witness and learn more about the TCU Rhino Initiative. The priority deadline for spring 2019 applications is Sept. 15. The Center for International Studies would like to admit as many students as possible for the program in the spring. “Although everyone wants to study abroad somewhere in Europe, I highly recommend looking into South Africa if you want something different and to stretch your comfort zone,” said Mitchell Wong, a supply chain management major and program applicant. 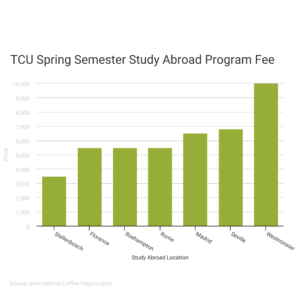 The TCU study abroad program fees for the spring semester.